Armando Peraza (born ca. 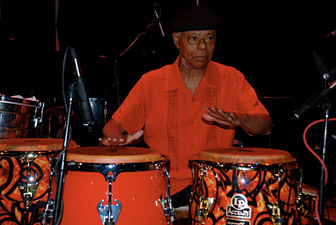 May 30, 1924 in Havana, Cuba) is a Latin jazz percussionist. Through his long associations with jazz pianist George Shearing, vibraphonist Cal Tjader and guitarist Carlos Santana, he has been internationally known from the 1950s through to the 1990s. Although primarily known as a bongocero and conguero, Peraza is also an innovative and accomplished dancer and composer. Peraza has been featured on classic recordings by Perez Prado, Machito, George Shearing, Charlie Parker, Tito Puente, Cal Tjader and Carlos Santana. Peraza's work with Shearing, Tjader and Santana brought him international fame. He has been inducted into the Smithsonian Institution's Hall of Jazz Legends and has had three official «Armando Peraza Days» by the City of San Francisco.